Singers Richard Perlmutter, lead vocals; Elin Carlson, soprano, Susan Boyd, alto; Jonathan Mack, tenor; Michael Geiger, bass. Plus various guest performers and soloists. Orchestras Budapest Symphony Orchestra, Compagnia D'Opera Italiana, Slovak State Philharmonic Orchestra, Polish National Radio Symphony Orchestra. Plus various guest performers and soloists. This is the celebrated follow up to the first Beethoven's Wig. Once again, Perlmutter's ingenious lyrics hit the spot with even more fact and fancy about these famous pieces and their composers. There's "Wow What a Wedding Cake," the song about a ridiculously oversized desert set to Mendelssohn's "Wedding March." It should be de rigueur at every grandiose wedding. And there's the overly repetitive and extremely long song that audiences count along to at every Beethoven's Wig concert, "It's the Same EveryVerse," sung to Grieg's famous "In the Hall of the Mountain King." You can also hear an opera singer come out of her shell and go wild in "Sing Verdi Very Loud," from Verdi's "Rigoletto." And saddle up and go nowhere to "Stuck in the Saddle Again," from Suppe's "Light Cavalry Overture." This album won Perlmutter his second Grammy Award nomination and also was named and American Library Association "Notable Recording." 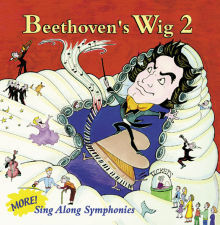 Reviewers called Beethoven's Wig 2 "a rare and special album," "rollicking fun!" and "great for the whole family." One more said, "Only 5 stars, it deserves 10!" It's a worthy follow up to Beethoven's Wig and another must for any family's music collection.